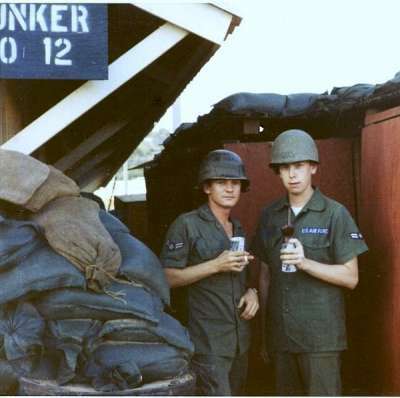 This is a picture of Dave (left) and Pete (right) outside of one of the Headquarters Squadron bunkers at Phan Rang. Dave's famous "F**k You" Finger is sitting atop Pete's can. Dave eventually made it into a necklace that he wore underneath his shirts while in Saigon. Dave and Pete also drew peace symbols and some wording on their helmets. 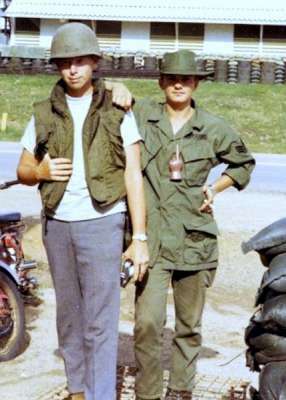 This is Pete (left) and Dave (right) standing outside the Headquarters barracks just after they arrived at Tan Son Nhut AB, Saigon. Observe carefully that Dave is proudly wearing his "F**k You" Finger Necklace. 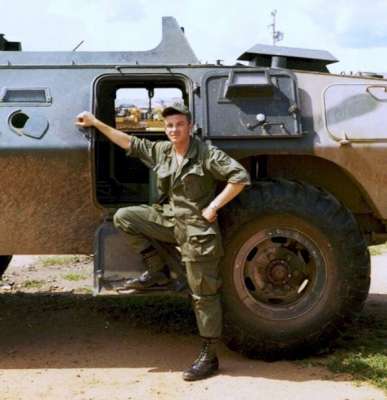 This is Dave outside of an APC. This is a photo of a Vietnamese plantation that Dave took during one of his convoy runs along Highway One. This is Dave standing on a beach by the Red China Sea. 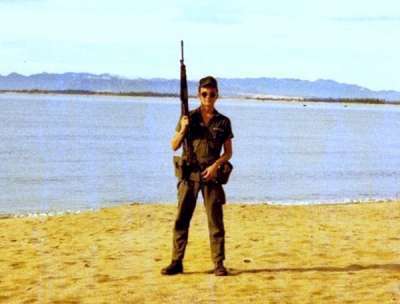 This was a "resort" area and swimming area for allied forces that was close to Phan Rang. Since most people went there to swim, a few designated troops had to pull the guard duty routine. 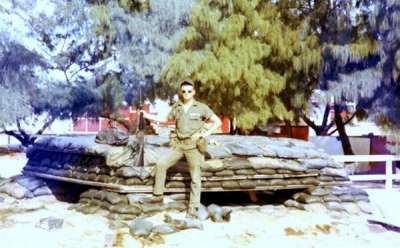 This is Dave standing in front of one of the bunkers at the beach. They were built in the event that an attack was made on the troops there by sea. Back to Dave Rabbit: The Man, The Myth, The LEGEND!